NEW YORK - China National Offshore Oil Corp (CNOOC) Ltd, China's largest offshore energy producer, agreed to pay $570 million in cash for a one-third stake in Chesapeake Energy Corp's Niobrara shale project, adding to its US holdings in crude oil production. The Chinese explorer also agreed to pay 66.7 percent of Chesapeake's costs up to $697 million to drill and complete wells in the area, the companies said in a statement on Sunday. The deal follows President Hu Jintao's state visit to the United States in January to expand economic ties, and will give CNOOC its second US energy asset. The Hong Kong-listed explorer will pay about $866 a hectare for the one-third stake in Chesapeake's 323,887 Niobrara hectares and has the right to a 33.3 percent stake in future acquisitions in the formation in Colorado and Wyoming. "If you look at President Hu's recent trip to Washington, there seems to be a greater willingness in the US to encourage Chinese investment," said Wang Aochao, head of China energy research at UOB-Kay Hian Ltd in Shanghai. "We don't have all the details at hand, but it appears to be a fair price for these assets. The Chinese oil majors still think valuations generally for oil and gas assets are reasonable." Niobrara covers 821,756 square kilometers and may contain 103.6 million barrels of oil, the US Geological Survey estimated in 2006 before Chesapeake, EOG Resources Inc and other producers began drilling the formation. "The project will not only strengthen our solid resource and production base overseas but create value to the shareholders in the long term," CNOOC's Chief Executive Officer Yang Hua said in the statement. CNOOC has risen 52 percent in Hong Kong trading in the past 12 months, outpacing the 15 percent gain in the benchmark Hang Seng Index. The shares closed at HK$17.20 ($2.00) on Monday, falling 0.69 percent. The Chinese energy explorer forecast a 12 percent increase in oil and gas production in 2011 after spending about $8.4 billion in the past year acquiring assets in the US, Africa and Argentina. By contrast, output rose 44 percent in 2010. CNOOC, based in Beijing, completed its $1.08 billion purchase for a one-third interest in Chesapeake's Eagle Ford project in South Texas in November. The Niobrara deal may be completed in the first quarter of this year, according to Sunday's statement. "The win-win deal valuation is fair, based on our estimates, and CNOOC's strategy to further expand into the oil-rich shale deposits in the US," said Gordon Kwan, head of regional energy search at Mirae Asset Securities in Hong Kong. 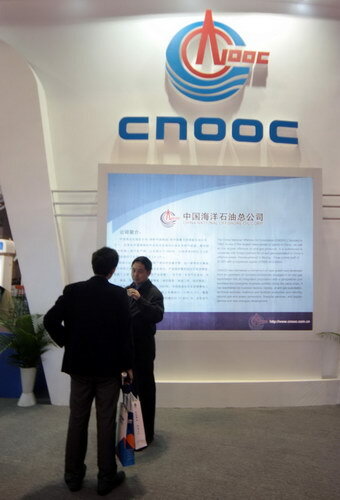 "The total investment of $1.27 billion in the deal through 2014 is manageable and equates to about 14 percent of CNOOC's budgeted $9 billion for 2011." The Niobrara deal will lead to a reduction in US oil imports over time and the creation of thousands of jobs, Chesapeake's Chief Executive Officer Aubrey McClendon said in the statement. "This transaction will provide the capital necessary to accelerate drilling of this large domestic oil and natural gas resource," McClendon added. Chesapeake expects to double its drilling rigs to 10 by the end of the year from the five currently operating in Wyoming's Powder River and Colorado's Denver-Julesburg basins. It plans to have 20 rigs working by the end of 2012. Chesapeake, the most active US gas and oil driller, has 16 wells producing in those basins with initial output as high as 1,000 barrels of oil and 3 million cubic feet of natural gas a day, according to the company. The companies plan to eventually produce the equivalent of as much as 5 billion barrels of oil from the basins.